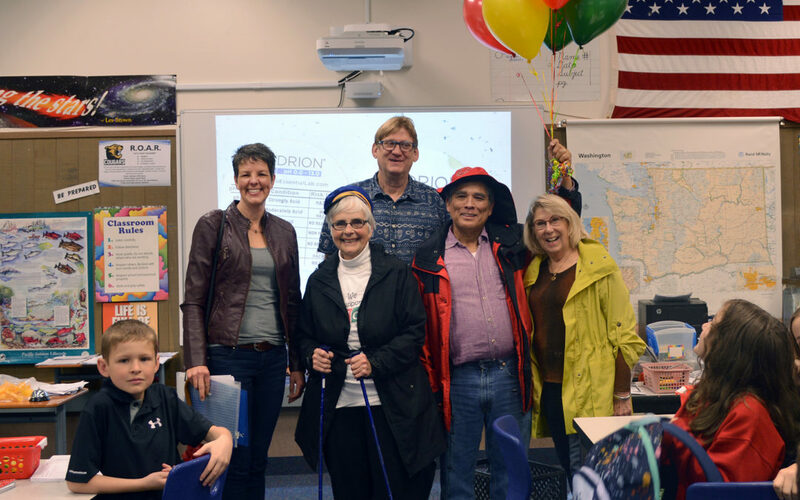 Neither dark skies nor rain could suppress the happiness generated during Thursday’s South Whidbey Schools Foundation grants notification visit to teacher classrooms. SWSF Board President Shelly Ackerman was joined by VP Clyde Monma, plus Board Members Jean Shaw and Cynthia Shelton. Together they handed out grant notification letters to most of this year’s 23 recipients. A record-setting $39,904 in grants was awarded through the Schools Foundation, thanks to the generosity and support of our community. Funds were raised through year-end donations, our annual Gala, our two Dine Out Programs in October and March, and through our Adopt-a-Grant patrons and organizations.